I went to Meijer this morning to look around for some stuff I haven't been able to find at Wal-Mart. I was looking for coffee straws in the kitchen section and got sidetracked (shocker!) looking at everything else. 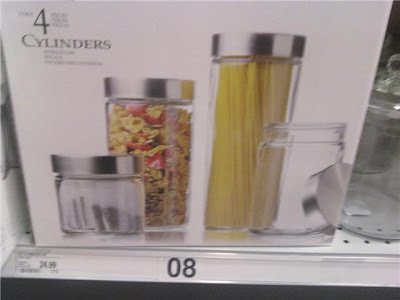 I came across these canisters, and let me tell you, don't buy these. These are mine that I got at Hobby Lobby for $6 total. They are identical, not one thing is different about them. Go to Hobby Lobby and get them if you want them. 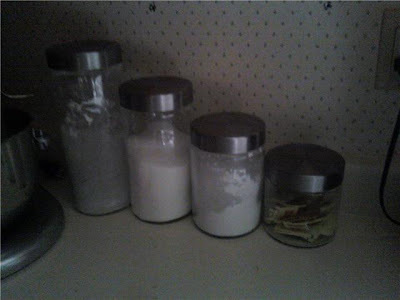 Or any canisters, they had lots there. It seems like everything is always 50% off at HL, so make sure they are. 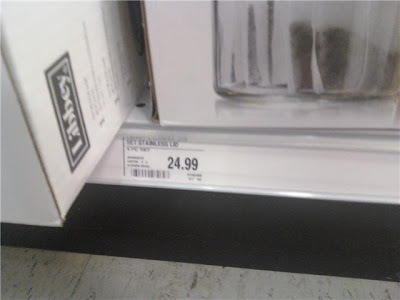 If they aren't on sale, wait a few days, because they absolutely will go on sale. See my hideous wallpaper. Yuck.